Copyright 2005-2009 AlexEdg AllEdges (www.alledges.com). 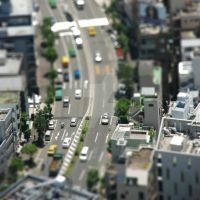 Postprocessing: Tilt-shift, Miniature Fake, Xpro. very nice shot, sorry its d... good. i love NY and Tilt shift lenses, this is just great! I dont think a lense works like this? Just saying. We Love Tilt and shift !! a bit too extreme maybe, but works nicely in the end! this is so cool but how work this.. that we think its so small but its only the sharpness? Thank you for inspiring the hell out of me! these colors and blur , great! Congratulations! This piece has been FEATURED in my latest news article, "Autumn Fragility"! Don't forget to give it a fave! Have a great day! Nice use of blur filters ^^. This is great, I can just imagine it being on the cover of a book. Wonderful job. It helps so much to appreciate work like this -when the before is seen. especially since you added typography. Hey...great piece of work! I used the link to see what it was like before. You did a heck of a job with this! I will be taking Photoshop this next semester, and hope to learn how to do things like this. Very impressive!